Luxury is the word when it comes to the Oceania Riviera. Personalized service and exquisite, detailed ambiance are waiting for you on any of the Oceania Riviera cruises! Suitable for the 55 and over crowd, as well as adventuring couples, the cruise ship Riviera combines adventure with relaxation as well as entertainment and education. 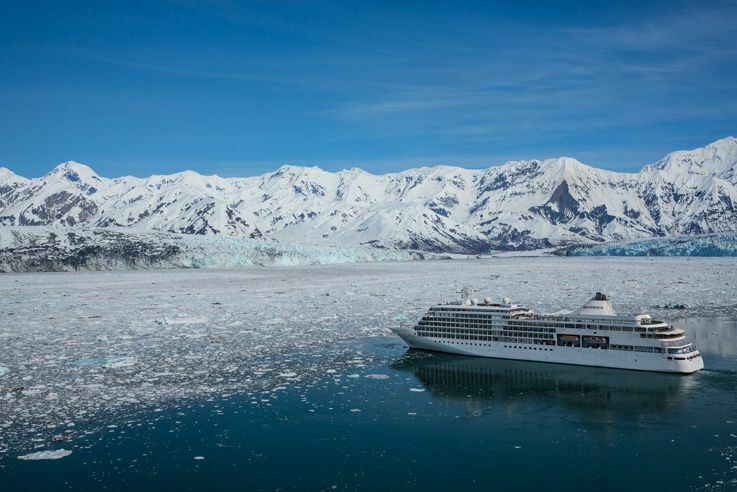 We believe that you will love this top-rated luxury cruise! Step onto the Oceania Riviera and be swept away in the “country club ambiance” that its guests so faithfully adore. Oceania Riviera cruises are top-rated for luxury, ideal couple cruises, and cruises through Europe. 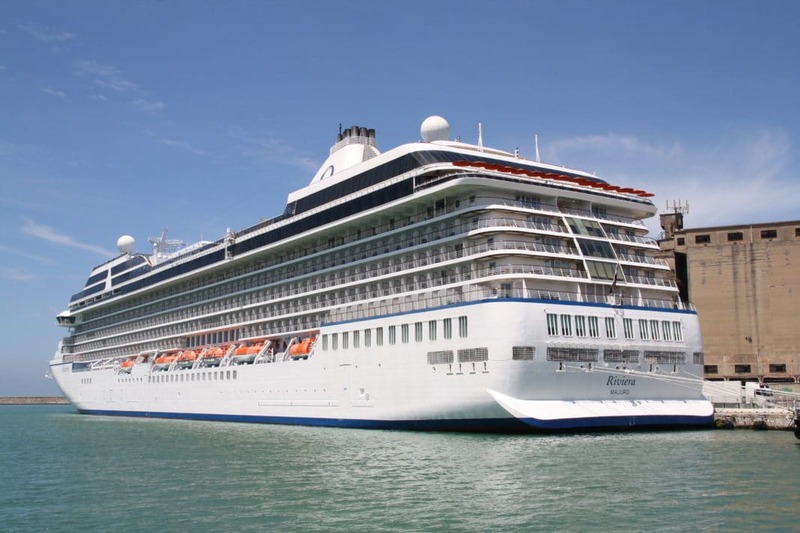 With 1,250 passengers and 800 crew members on board, Oceania cruise line Riviera boasts a 1:2 crew to passenger ratio. 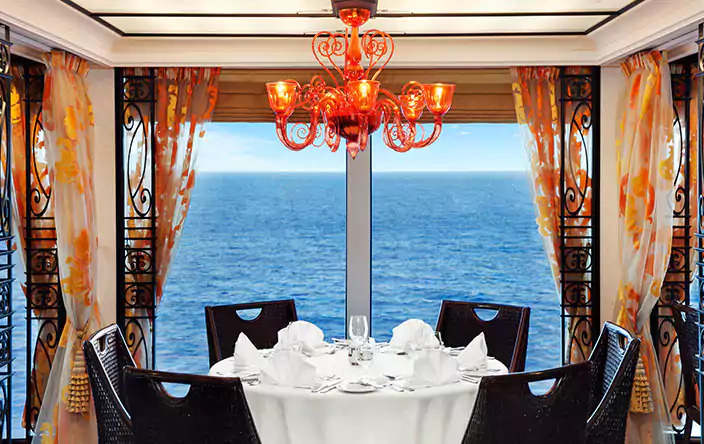 The Riviera cruise line is able to maintain personal service on its vessel and guests repeatedly sing praises of the uncrowded atmosphere on board. Ideally proportioned, this mid-sized vessel can easily slip into smaller ports, offering more intimate excursions, unavailable to larger cruise vessels. The Riviera cruise was crafted with the foodie and the travel connoisseur in mind. Offering over a dozen dining options as well as wine tastings, culinary courses, and chef-led onshore foodie excursions, the foodie in you will overwhelmed with the opportunities to taste, learn, and savor. Guests can sail the world on the Riviera cruise ship! From Alaska to the Caribbean to the Middle East, guests can set sail from Miami and return to the port when they return. Be sure to browse Oceania Riviera’s top-rated European cruises, a popular choice for most of Riviera’s returning patrons. 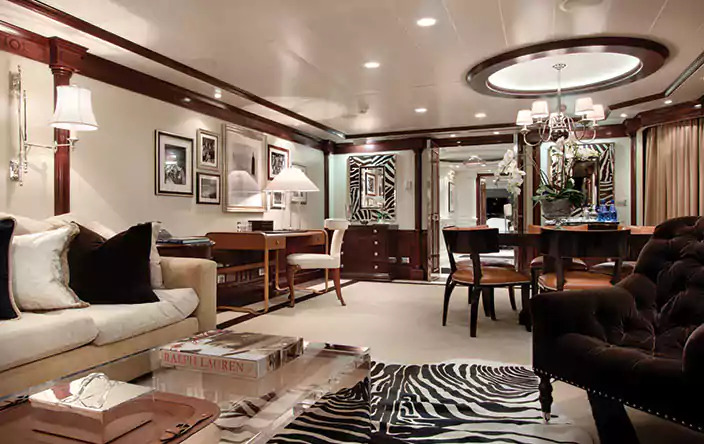 The spacious atmosphere and the luxury style of the cruise line, permeate every inch of the Oceania Riviera deck plan, most importantly in its suites and staterooms. Lay your head on a goose-down pillow and sleep sound in the exclusive Oceania Riviera Prestige Tranquility bed. We think this sound divine after a long day of adventuring on board or on shore. Grab your Riviera robe and get cozy as you take in the maritime views on your private teak veranda. Twice-daily maid service guarantees you will spend more time enjoying on board and on shore activities. ​Penthouse suites offer sizable living and dining areas as well as granite bathrooms complete with bathtub, separate shower, and walk-in closet. Owner’s Suites, Vista Suites, and Oceania Suites offer bedrooms with king beds and dining areas adorned with lavish furnishings from the Ralph Lauren Home Collection. Guests will be greeted and served by classically trained and formally attired wait staff. European-inspired cuisine will be served in multiple courses with varied menu choices. This dining option is open for breakfast, lunch, and dinner. With a little something for everyone, all patrons will enjoy their dining experience at the Grand Dining Room. This dining option is for steak and seafood lovers. Focused on tradition, even the Classic Caesar Salad is prepared tableside as according to custom. Serving dinner exclusively, guests can plan to enjoy a tender USDA Prime and dry-aged steak as they soften into their burgundy leather chair at the end of a day of activity. You will be transported to the streets of Paris in this Parisian-inspired bistro. “Pure French ambiance” will meet you as you savor any of Master Chef Pépin’s slow-roasted chicken, duck, pork, or beef. Enjoy this option for dinner exclusively. For a burst of Asian tradition, dine for dinner in the Oceania Riviera contemporary classic, Red Ginger. Striking red and black decor, dotted with modern Asian artwork, will make guests feel as though they have stepped into an oriental paradise. Start with a Salad of Spicy Roast Duck and Watermelon with Cashews, Mint and Thai Basil with a Malaysian Beef Penaeng with Coconut Rice and Paratha Roti to follow. The Terrace Cafe is an informal dining option for those who want to grab a bite, breakfast, lunch, or dinner, between on board or on shore activities. Dine inside or outside on the Riviera ship, the choice is yours! All American favorites poolside? What could be better? Grab a burger, some barbecue, or a seafood inspired bite to eat. Sip a fresh juice or smoothie from the Raw Juice and Smoothie bar as you relax on the deck. 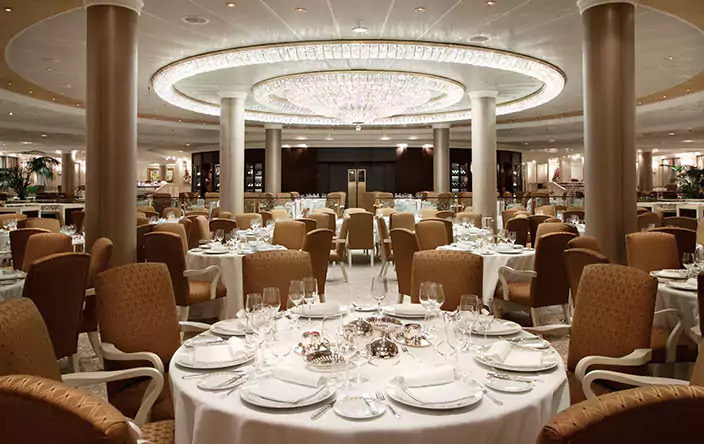 Grab 10 of your closest friends and enjoy a private dining experience on the Oceania Riviera ship. This intimate dining venue is lavishly adorned and provides menu options from Toscana and the Polo Grill. This on board favorite offers wine seminars, vintage wine tastings, and gourmet dinners, pairing wines with an elegant seven-course meal. An exclusive experience for the guests of Oceania Riviera, crafted by the Wine Spectator. Savor complimentary iily espressos and coffees and snack on a yummy pastry at the Barista coffee bar throughout the day. 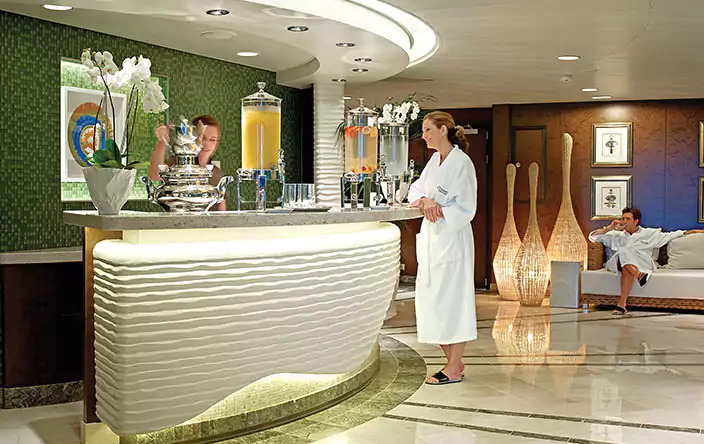 Choose from 6 bars or lounges at sea. Visit the Waves Bar throughout the day for drinks to enjoy poolside or hit the Casino Bar at night while enjoying a delectable cocktail. Work up a sweat at any variety of fitness classes offered through the fitness center in the Oceania Riviera Canyon Ranch Spaclub. Relax with a deep-tissue massage or drop in on a presentation on nutritional balance or spiritual wellness. Before heading to dinner, stop at the Styling Salon where beauty professionals will treat you to a makeover. Concierge and suite level guests can enjoy unlimited access to the Spa Terrace where they can lay by the pool on the private sunning deck. All guests on the Oceania Riviera ship can take a dip in the large heated pool and adjacent whirlpool spas. Guests will find leisure on the golf putting green, play shuffleboard or a game of croquet or bocce. Get lost in a book in the English-style library or browse the web in the computer center. Internet packages are available to all guests. Free internet packages available to guests in Concierge Verandas and Penthouse Suites, as well as guests in the Oceania, Vista and Owner's Suites. Live as the British do and drop in for daily 4 o’clock afternoon tea! As the string quartet plays in the background enjoy pastries, desserts, and an array of herbal teas. No reservation required! Exercise your right brain with the artists-in-residence as they walk developing artists through step-by-step painting or sketching courses in the Artist Loft. Test your luck at Casinos at Sea! Join the rewards program and earn free games and complimentary drinks as you play! Allow the shows on board to wow you or, perhaps, leave you thoughtful and melancholy. Choose from a bold and thrilling production or themed music set or an intimate and sophisticated live piano experience on board the Oceania Riviera. Calling all foodies on board! 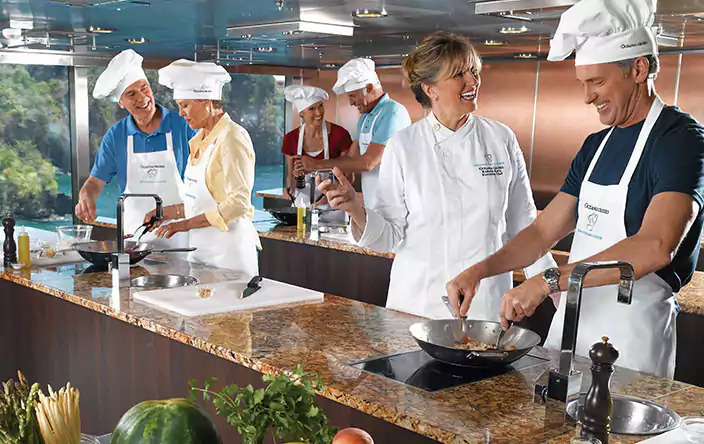 Join master chefs in the Culinary Center to procure culinary insight from any of the 10 courses taught on board. From “Argentine-Style Master Grilling” to Asian-inspired “Red Ginger Favorites.” They may just invite you join them ashore as they shop for fresh ingredients at local markets! Guests agree that the Oceania Riviera is a foodie’s paradise. Patrons sing praises of the excellent staff and well-maintained cruise ship. When it comes to Oceania Riviera itineraries, guests are thrilled over the destination choices, but recommend planning and booking your own excursions. Excursions through the cruise line prove to more pricey and folks suggest cheaper self-led adventures. All travelers agree this cruise is most suitable for the 55 and over crowd. The nightlife is relaxed and the cruise itself is quiet and peaceful. Typical of the Oceania Riviera cruise line is its ability to obtain repeat patrons! If a smaller vessel is what you’re looking for, check out Oceania’s Regatta, Nautica, Sirena, or Insignia. These vessels carry up to 686 guests, compared to the 1,250 on board its mid-sized vessels. 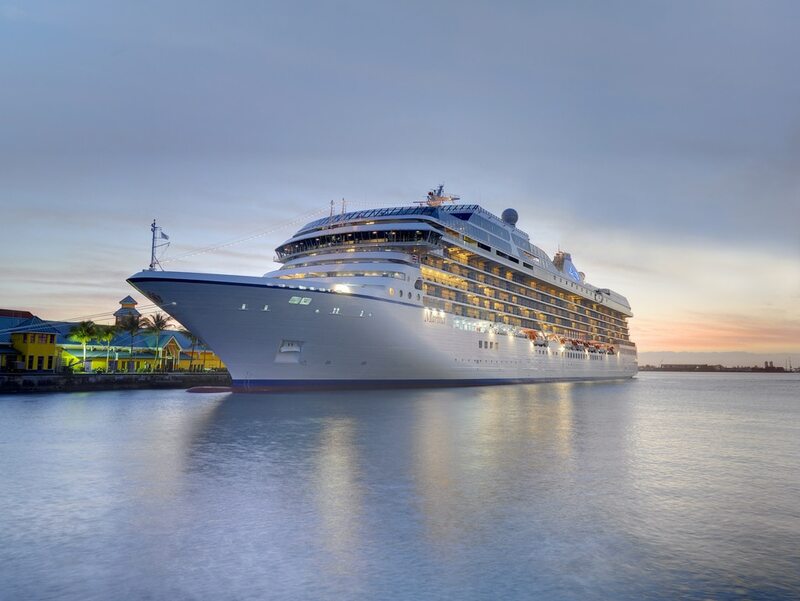 Just as Oceania’s mid-sized vessels, guests will experience personalized service and adventure around the world. Like the Riviera? Sail the Riviera’s sister ship, the Marina! Both mid-sized vessels, the Oceania Marina hosts similar dining options, entertainment, and amenities on board. This intimate cruise ship hosts 382 on board and is most suitable for couples and an older group of travelers. You will find that guests describe the Silver Shadow in the same way they will describe the Oceania Riviera -- simple, luxurious, and peaceful. Not lacking in culinary delights, foodies will be satisfied by diverse dining options. The Silver Shadow may be a perfect alternative for you. Cruise line guests should not have to settle for mediocre food, lackluster comfort, or unappealing activities on a grand adventure. Patrons will find diversity in the dining options, the excursions, and the amenities and entertainment on board the Oceania Riviera. 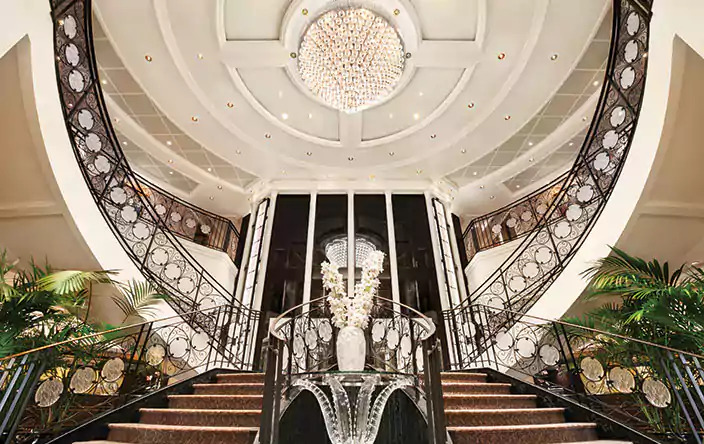 Sail in style and luxury from the elaborate staircase to the detailed decor, not to mention the maritime views that nature provides. Soak in the refined ambiance of the Oceania Riviera! Jordan wears many hats, but her favorite is daughter and friend. To Jordan, relationships make the world go 'round and connecting people across the globe (in big ways and small) brings her extravagant joy. Creation is her heartbeat and stories are her breath. She never drinks as much water as she should and sometimes goes to sleep without brushing her teeth, but she vows to work towards 'better' and always needs just a bit of grace.